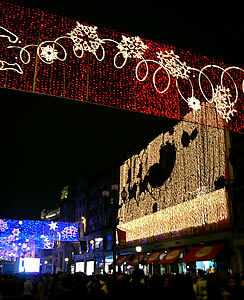 The pictures below were are of the Christmas lights in London in 2004. 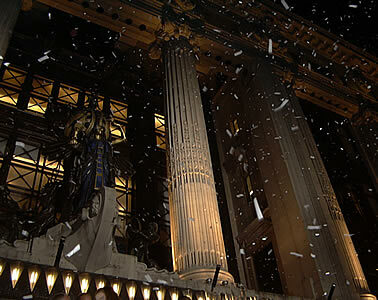 The ceremony for the switching on of the Oxford Street lights took place outside Selfridges. 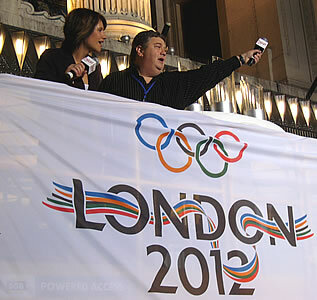 The theme for the lights was London's bid for the 2012 Olympics. 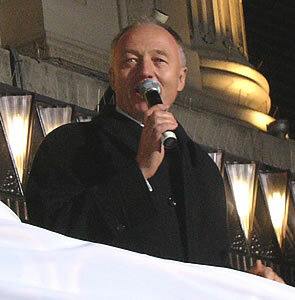 Former London Mayor Ken Livingstone gave a short speech in support of London's bid. 5 Olympic gold medalists appeared on stage. 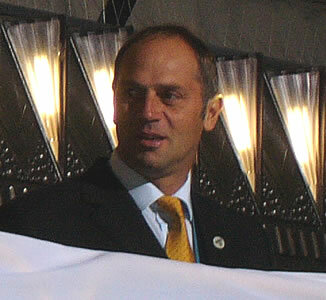 Sir Steve Redgrave has won 4 Olympic gold medals for rowing. 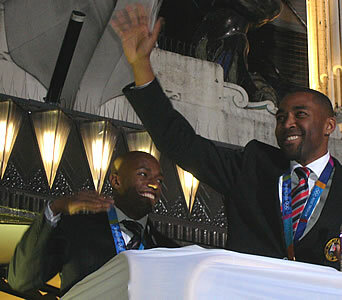 The 4x100m sprint relay squad won gold medals in the 2004 Olympic Games in Athens. 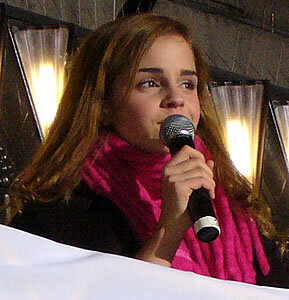 Emma Watson (who plays Hermione Granger in the Harry Potter films) also appeared. 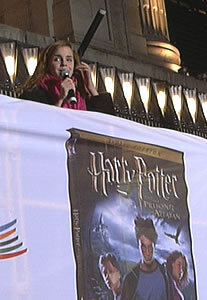 The DVD to the film Harry Potter and the Prisoner of Azkaban is released soon. 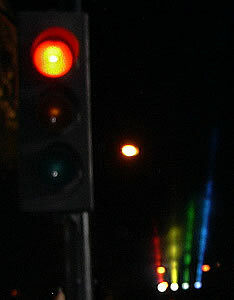 There is a light display each night during which the lights move to the sound of the film's soundtrack. 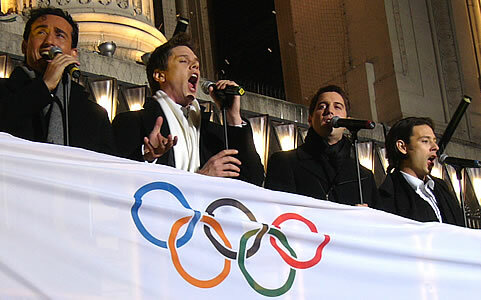 Il Divo - a new operatic vocal group produced by Simon Cowell - performed "O Holy Night" and "Unbreak My Heart (Regresa A Mi)". 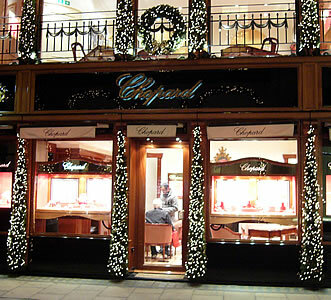 Their powerful voices and good looks have taken them to the top of the album chart in the UK. 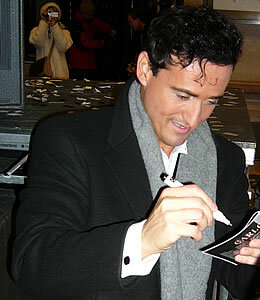 After performing they went to greet some of their fans and to sign autographs. 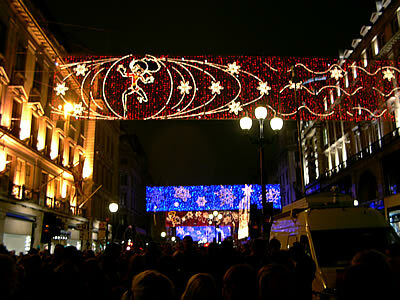 In 2004 the theme of the Regent Street lights is the film The Incredibles. 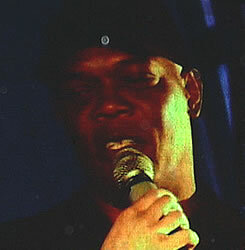 The actor Samuel L Jackson, who provides the voices one of the character Frozone in "The Incredibles", appeared on stage. 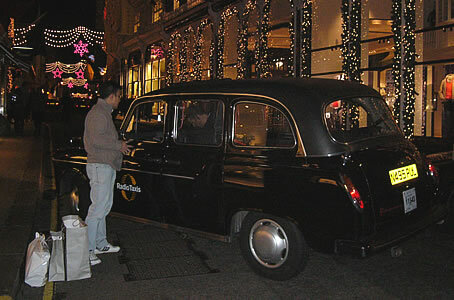 The lights were turned on by the British boy band Busted, who also performed several of their hit records. 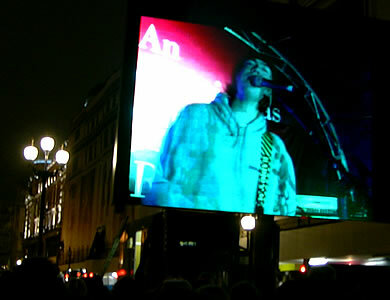 A screen was set up on Regent Street to allow the large crowds to see the stage. 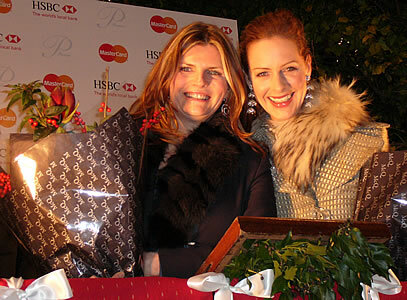 The 2004 Bond Street Christmas Lights were turned on by Trinny and Susannah (Trinny Woodall and Susannah Constantine), presenters of the popular BBC television series "What Not To Wear". 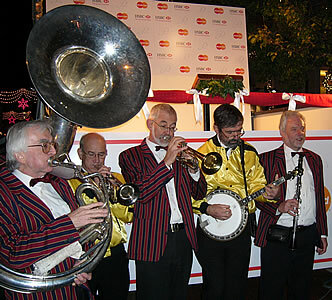 A choir sang Christmas carols, and a jazz band performed. The Norwegian Christmas Tree is an annual gift from the people of Norway: the tree is chosen specially from the forests around Oslo. It is given to thank Britain for supporting Norway during the Second World War: the King of Norway went to London after the country was occupied by Germany, and set up a "government in exile" here before returning to his country after the war had ended. 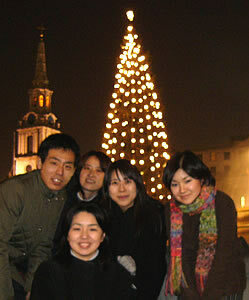 The tree is therefore not just a decoration, but a symbol of peace and of friendship. 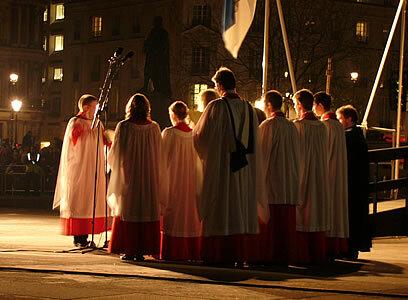 There is a short ceremony each year in Trafalgar Square, usually shortly after Advent Sunday. 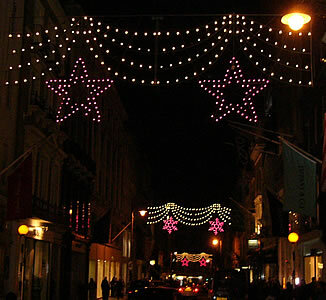 A choir sings carols, there are some short speeches by the mayors of Oslo and Westminster, and the Christmas tree lights are turned on. 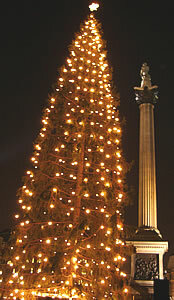 The lights on the tree are all white, which is the tradition in Norway. 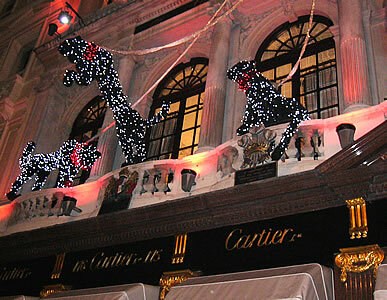 The fountains in the square are then turned on. 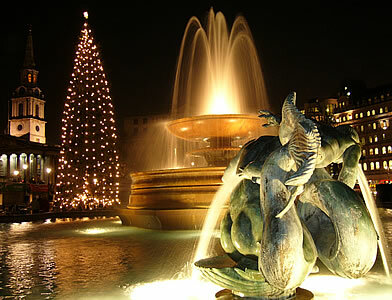 ... and the Trafalgar Square fountains are turned on.